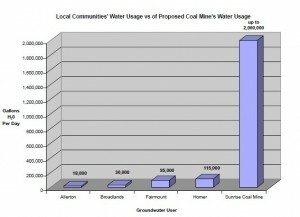 Sunrise's Coal Mine would use roughly ten times as much water as the four rural communities of Homer, Fairmount, Broadlands and Allerton combined. For generations we have dug wells and tapped the clean water that filters through sand and gravel and lies beneath our property. We’ve relied on its purity, and we’re accustomed to its taste. The presence of water beneath our land has guided the location of farmsteads and villages, and the presence of water gives our land part of its value. Historically, we have placed great importance on protecting the purity of drinking water in order to safeguard our health. quantity and quality of local surface and groundwater resources. When miners start work on a new site, they first develop surface facilities (buildings, roads, etc.) and start regrading the site for drainage. Because all rain water falling on a site will eventually drain to a stream, the mining company would build basins called storm water basins to help manage the flow. These basins are made by damming streams. There are two main concerns here. First, a portion of what used to be a stream is now a basin, and it would stay that way when the mine closes up shop. Basins do not drain farmland, streams do. Second, pollution from coal will be released into the basin and discharged (albeit at lower concentrations) in an ongoing steady supply. This pollution will include chlorides (salts that are toxic to fish), sulfates (salts that can be toxic and irritating to livestock drinking downstream), and heavy metals such as arsenic, lead, mercury and selenium(which contaminate drinking water and fish and which if consumed, lead to increased risk of cancer, learning disabilities, birth defects and other illnesses). Once a mine pit has been dug, the door has been opened for harmful materials to be disposed of underground. Currently in Illinois, regulators allow both coal slurry (the wash water leftover from washing coal) and coal ash (the ash left behind after burning coal at a power plant) to be dumped into mine pits with very limited protections for citizens. Both the slurry and ash are toxic, and if allowed to contaminate your groundwater supply, would render it useless. This is happening in several communities in Illinois. Another part of coal mining is washing coal in preparation for its use at a power plant. An additional stream would need to be dammed to create a slurry “impoundment” to catch the water used to wash the coal. This water, which is now called coal slurry, is filled with fine coal and rock particles, including harmful metals and salts. In Illinois, most coal slurry impoundments are not constructed with liners that would prevent contamination from coal slurry from seeping into the groundwater below. What’s more, “reclamation” of slurry piles usually involves draining off the water and covering the pile with dirt and clay, leaving a massive pile of coal process waste on the landscape. It should also be noted that coal washing is a “consumptive” process. This is because when the washed coal is put on conveyors, rail lines or trucks to transport it to the power plant, the coal is still wet. In effect, the trucks or trains will be carrying more than just coal with them as they leave the mine site – they will also be taking some of the community’s drinking water supply.